Veg Week is upon us, and I'd like your help to make it happen! Can you make a donation of $100, $50, or $25 today to support our work? Veg Week gives opportunities for people in a wide variety of circumstances to be empowered to help animals. Last week, I spoke to a young woman who said that she can't empathize with animals that she doesn't know. She told me that she doesn't know chickens. I quickly invited her to our chicken sanctuary tour that we're hosting on October 9, where she can meet chickens living in peace and get to know their unique personalities and see how they are living, thinking, and, when crammed in crates in factory farms, that they are greatly suffering individuals. For those who don't know what vegans get in a grocery store, we're offering a shopping tour with a vegan. For those who are unaware of the plight of animals on factory farms, we're distributing leaflets about the cruelties of modern animal agriculture at our Vegan Food Showcase on September 28. And for those who want to learn about the national efforts underway to advocate for farm animals, we're hosting a presentation by Paul Shapiro of the Humane Society of the United States on October 1. We have several more events and projects that help people take one more step to living out their latent compassion. Whether they're looking to socialize with other animal advocates, want to learn about vegetarian nutrition, or would like to try new vegan foods, Compassionate Action for Animals' Veg Week has something for them. But we need your participation, too, for this to happen. Please donate online or mail a check to PO Box 13149, Minneapolis, MN 55414 to help out. Please join us for our 8th annual Veg Week! Compassionate Action for Animals (CAA) started our celebration all things veg back in 2004. Over the course of one week we celebrate vegetarian diets, educate the public about compassionate food choices, and inspire respect for farm animals. Events include a potluck, a dine-out, a cooking class, and much more. Check out our calendar below for a full list of events and times, and please join us! If you haven't already, take the pledge and get discounts at restaurants and more! Please join Paul Shapiro of the Humane Society of the United States to learn about how you can help farm animals! Want to be inspired, amused, entertained, saddened, and did we say inspired? This is the workshop for you! Hear from one of the nation's most seasoned farm animal advocates on why these animals' plight is so dire, the truly amazing work that's being done to help them, and how YOU can get involved and take action for the too-often forgotten and terribly abused billions of animals who suffer in the meat, egg, and dairy industries. The menu will include Butternut Squash Bisque, Walnut Sage Pasta, and Cranberry, Apple, and Pear Crumble. Not sure where to start at the store to get healthy vegan food? Come on out and shop with a vegan! We'll talk about balanced plant-based nutrition and do a store walk through so you can stock your cart with the basics! 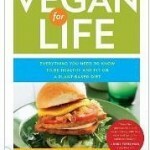 Join Suzy Sorensen, Vegan Dietitian. Please RSVP to suzy@exploreveg.org. We have room for 12 people at this event, so reserve your spot early! Satisfy your inner sweet tooth through CAA's very own baketivists! We'll be selling cupcakes, bars, and brownies to raise funds for Veg Week. 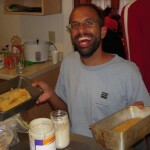 See how tasty dairy- and egg-free baking can be, and support our work to advocate for animals. Come enjoy delicious Nepalese, Tibetan and Indian food with some incredible company. Everest's menu offers many vegan dishes to choose from. This dine-out is an excellent opportunity to learn about the excellent ethnic veg food options in the Twin Cities, and a great way to meet fellow animal activists! Let's celebrate the hard work of the volunteers that made Veg Week possible. Everybody's invited: volunteers will be appreciated, and everybody else can show their appreciation.Whether you are the appreciated or the appreciators please come and join us as we celebrate over some good food and drinks. Jasmine 26 has gained an esteemed recognition for their contemporary take on authentic Vietnamese cuisines, ranging from their wonderful salt and pepper tofu to their amazing selection of curries. Jasmine 26's bar offers signature cocktails and spiked or virgin bubble teas that are exotic, vibrant and refreshing. Voted best cocktails in the Twin Cities by City Pages 2008. What better way to celebrate Veg Week and try some great veg food than with a vegan potluck? While some food will be provided, everyone is encouraged to bring a vegan dish (no animal products) to share that serves around five to eight people. Also, it is encouraged, but not necessary, to bring your own plate and silverware. This is a great opportunity to sample dozens of delicious foods, meet cool people from the community, and have fun. If the weather is nice, we'll be outside! Most of us are familiar with chickens as providers of eggs and meat, but we've had little opportunity to meet individual chickens and get to know their personalities. Please join us at the home of Leah and Brian Wasieleski, where they have 29 chickens living in peace. There are a variety of treats you can bring for the birds–they really enjoy guests who bring them goodies, and people learn so much from interacting with them that way. Foods you can bring include greens (on the head is best), melon, raisins, grapes, cob corn, tomatoes, cucumbers, tofu, cooked pasta, whole wheat bread. All you have to do is pledge to eat vegetarian or vegan from Saturday, October 1, to Sunday, October 9. Participants will get a special care pack and discount card, which will get you deals at many local restaurants, such as Hard Times, Camdi, Evergreen, and more! We'll provide recipes, tips, and raffle prizes. Come to any of our Veg Week events for more resources and good times! We're hosting our 8th annual Vegan Food Showcase on the West Bank of the University of Minnesota, Twin Cities, and we need your help to make it happen! Join us on September 28th for one of the most fun and effective actions we do to advocate for animals: give free vegan food samples and literature about factory farming to thousands of college students. 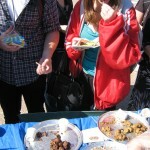 You can help out for one hour or three, and enjoy the food and smiles as we hand out samples to the campus public. The Twin Cities leads the nation in volunteering, according to a new survey by the federal government as reported by the Star Tribune. The study by the Corporation for National and Community Service found that 37.1 percent of Twin Cities residents volunteered in 2010. This is higher than any other metropolitan area. Thanks to all the volunteers at Compassionate Action for Animals for volunteering! It's your hard work that makes everything we do possible. 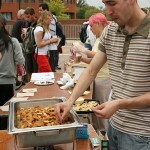 From potlucks and dineouts to Veg Week and leafleting and much more! Your help in planning events, making food, calling your friends, or greeting people at the door makes a difference. With your generous contribution of time, energy, and talent, we are able to advocate for animals and reduce their suffering and death. We care about the mistreatment of animals, and we know that our greatest tool in changing the way they are treated is our own voice. Read the entire Star Tribune article. Michael Greger, M.D., has a new website, nutritionfacts.org scours the world of nutrition research to give you information that is easy to understand. Posting a video every day, NutritionFacts.org is the newest resource for vegan nutrition. The site is created by the Jesse and Julie Rasch Foundation in partnership with Dr. Michael Greger. Dr. Greger has spoken for Compassionate Action for Animals before, and we know him to be a knowledgeable source about nutrition. 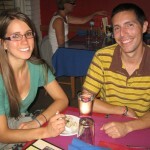 NUTRITIONFACTS.ORG is brought to you by the Jesse & Julie Rasch Foundation in partnership with Michael Greger, M.D. Dr. Greger scours the world of nutrition-related research, as published in scientific journals, and brings that information to you in short, easy to understand video segments. The Compassionate Action for Animals' Board of Directors is pleased to announce that Unny Nambudiripad will be CAA's new Executive Director! Unny will work for CAA full time and begin in this role as of Monday, August 22. Danielle Smith, our current Director of Volunteer Programs, will be leaving as of Friday, August 5. Danielle says of her departure, "I have absolutely loved my time with CAA and will cherish the connections and memories I have made. I owe CAA so much. Not only has the organization supported me in professional ways, I have also grown stronger as an animal activist." She continues, "I hope to stay connected to the organization and look forward to the possibility of serving on the board of directors in the near future. I am also happy to know that Unny, who will be taking over volunteer coordination, is someone you are all familiar with. I believe that many great things are in store for CAA in the years to come." Unny says, "I'm excited at the opportunity to take CAA to the next level. I've had a lot of fun working with dynamic leaders, hundreds of enthusiastic volunteers, and businesses, donors, and partner organizations to raise awareness about the plight of animals. Sometimes it is challenging to find the motivation and energy to be an effective advocate, but I'm confident that with your help we can make big changes for the animals we are here to protect." 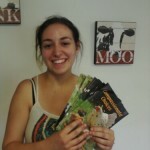 Unny is a co-founder of Compassionate Action for Animals and has over 15 years of nonprofit experience. He has conducted investigations on factory farms, passed out leaflets, has written for local publications on animal issues, and planned social events. Additionally, Unny has led our fundraising efforts for the last five years, managed volunteers, served on the board of directors of several organizations, and coordinated strategic planning and budgeting. Because of his combination of experience and commitment to CAA's mission, we are excited to promote him into this position. Volunteering – Fill out a volunteer form and get involved. Donating – You can donate online now. 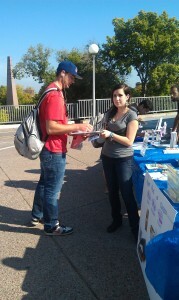 By attending CAA events, meeting new people, and learning more about the issues. The Board would like to thank Danielle for her work over this past year. We wish her all the best in her future endeavors. We are excited to have Unny joining us full time and we look forward to what CAA will accomplish in the future.